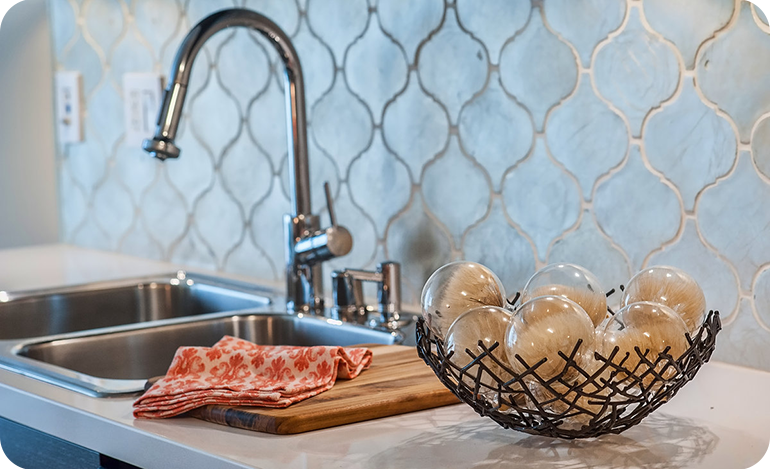 This gorgeous handmade Contessa tile is from Walker Zanger. The pale silver/gold leaf is called Arabesque Silver and its use was a bit of a departure from my Mid-Century Mod aesthetic. I am so pleased that this tile was installed and can’t imagine using much of anything else in the Dwell Labs kitchen. The tile is elegant, modern in its own right, and has an air of Hollywood Chic. The metallic also tied in well with Phillip Jeffries metallic grasscloth wallpaper that was used in the office and bedroom of the space, tying everything together. This kitchen at 1600 Vine had not been updated before the project, which allowed me to update the backsplash, countertops and cabinetry, thus giving the kitchen a completely new look. This unit is only 612 square feet, and practically every area is visible upon entry, so I used a cohesive design to give the feel of a luxurious, harmonious dwelling. The glass ornaments are seed orbs from Richard Soloman and were a last minute, yet ideal addition to this photo. These orbs can be placed in a bowl, or used as Christmas ornaments – they are truly spectacular when backlit! Many thanks to Walker Zanger for providing the tile, Caesarstone for the kitchen countertops, and Hansgrohe for furnishing the kitchen faucet.